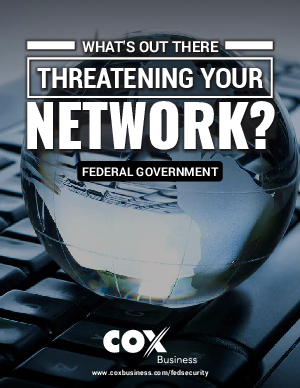 > Cox Business > Federal Government Edition: What's out there threatening your network? As we continue to move forward into an age of big data, optimization, and shared information through the capabilities of better networking technologies, opportunities have never been greater for using technology to improve the way the government interacts with constituents. However, increasing dependence on web and network services also makes government a tempting target for hackers. Distributed Denial of Service attacks, data breaches, leaks, the risks can be enormous. Recent events have shown us that now more than ever, government servers are getting victimized by well-funded teams of foreign hackers, possibly funded by their government.